Grid computing has caused changes in scientific interaction and develop new social communities. In fact, the interaction between remote, international, multicultural and interdisciplinary communities, around technological facilities, such as Grid computing, is unprecedented in the history of social science. Nowadays, social scientists are interest in Grid Computing activities in behalf of the development of scientific networks and new scientific communities in different regions of the planet. In the past days, the Group of Research in Sociology of America Latina (GRESAL) at University of Grenoble, in France, has developed a conference-debate about the challenges and opportunities for the academic and scientific networks developed in Latin America. Then, French sociologists invited Professor Luis Núñez de Villavicencio for this meeting. 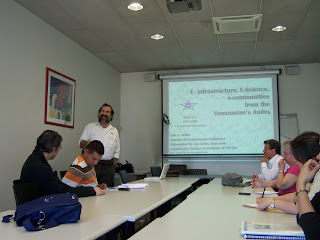 Luis Núñez de Villavicencio is a Venezuelan scientist, professor of the Universidad de los Andes at Mérida, Venezuela, scientific director of the Venezuela National Center of Advanced Computing (CeCalcULA) and one of the leaders and promoters of the academic and scientific networks in Latin America. Latin American scientific networks based on Grid Computing, have allowed the interaction and participation of projects among countries than before, for political or economic reasons it was unthinkable to propose a collaboration. Indeed, this partnership around e-Science possibilities, allows the treatment of regional problems, and contribute to participate Latin American scientists in global projects. Latin America scientific networks developed in this context have enabled mutual understanding, with real transnational projects, and facilitate the dialogue between Latin America and the world.